During November 4-6, Prof. Jin and his research group staffs attended the 1st International Symposium on Carbon-based Materials for Water Transfer (2016) in Shanghai Institute of Applied Physics. Prof. Jin cochaired this conference and gave an oral presentation titled “Design and Fabrication of Graphene-based Membranes for Molecular Separation”. 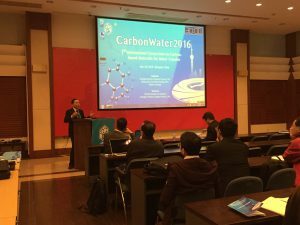 CarbonWater16 is focused on advances in carbon-based materials for water transfer. This conference provides an excellent platform for researchers from different disciplines to review the latest progress on carbon-based materials for water transfer, and exchange their experience and innovative ideas.